Hi all. I recently acquired what I believe to be a cowboy companion or navy hunter. Rifle came with a receiver cover scope mount, a wood stock, and the rifle mounted in a black plastic stock. Anyone know where I can find the correct scope mount and scope? I only paid a hundred bucks for the gun so not sure if its worth spending money on it or not. Bore and parts are in great shape. when you say, "where can I find the correct scope mount and scope? 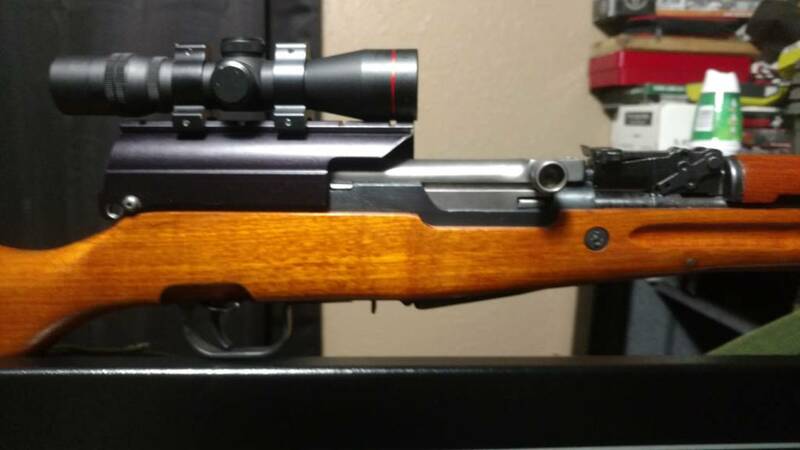 ", there is no correct scope or rings for a receiver cover scope mount. those were after market Chinese made scope cover mounts that folks bought to replace the original receiver covers so they could add a scope to it. typically, they usually were RED STAR scopes as those were very cheap and there were several variations. and you're asking about that kind of mount and scope, then those mounts are scarcer then hens teeth to find, and if you do find one they are big bucks. the scope that came on those mounts are nothing special it's a cheapie RED STAR 4x20 scope. there were 2 or 3 different mounts for it, and they only fitted that particular rail and nothing else. A possible Navy Hunter SKS for $100! Post a few photos of what you bought and focus especially on the mount. We can help point you in the right direction. I also have the wood stock with the cleaning kit inside. finding the mount for that, like I said, is going to be tough, they are not easily found. you could check the auctions sites, EBAY, GUNBROKER etc... to see if one pops up. it was by sheer luck that I came across the one on my "cowboy companion" at a gun show junk table years ago. wasn't looking for one, just happened on it. Are these guns worth keeping around? Not sure of where to check values on them. Thanks for the info. any gun is worth "keeping around", especially military or their clones. SKSs; like the Chinese, Russians haven't been imported for more then 20 years, you can forget about any imports now or in the future. so what is here is here, and the value isn't going to go down, it's just going to rise. The best mount I have seen is made by b square and it allows the use of the scope or open sights. It goes over the original cover and is pretty solid. When I purchased this mount it came with a Simmons 4x28 scope and that was in 93 but I see the mount is still available through eBay.